Joan Didion, reporting in San Francisco, 1967. Joan Didion is a noted American writer whose essays helped define the New Journalism movement in the 1960s. Her sharply etched observations of American life in times of crisis and dislocation also played a role in her novels. When President Barack Obama presented Didion with the National Humanities Medal in 2012, the White House announcement cited her "works of startling honesty and fierce intellect" and noted she had "illuminated the seemingly peripheral details that are central to our lives." Born: December 5, 1934, Sacramento, California. Known For: Helped transform journalism in the 1960s with her sharply crafted essays that evoked America in crisis. Recommended Reading: Essay collections Slouching Toward Bethlehem and The White Album. Honors: Multiple honorary degrees and writing awards, including the National Humanities Medal awarded by President Barack Obama in 2012. In addition to her novels and literary journalism, she wrote a number of screenplays in collaboration with her husband, the journalist John Gregory Dunne. Joan Didion was born December 5, 1934, in Sacramento, California. World War II broke out days after Didion's seventh birthday, and when her father joined the military the family began moving about the country. Life on various military bases as a child first gave her the sense of being an outsider. After the war the family settled back in Sacramento, where Didion finished high school. She hoped to attend Stanford University but was rejected. After a period of disappointment and depression, she attended the University of California at Berkeley. During her college years she exhibited a strong interest in writing and entered a contest for student journalists sponsored by Vogue magazine. Didion won the contest, which secured her a temporary position at Vogue. She traveled to New York City to work at the magazine. Didion's position at Vogue turned into a full-time job which lasted for eight years. She became an editor and a highly professional writer in the world of glossy magazines. She edited copy, wrote articles and movie reviews, and developed a set of skills which would serve her for the rest of her career. In the late 1950s she met John Gregory Dunne, a young journalist who had grown up in Hartford, Connecticut. The two became friends and eventually romantic as well as editorial partners. When Didion was writing her first novel, River Run, in the early 1960s, Dunne helped her edit it. The two married in 1964. The couple adopted a daughter, Quintana Roo Dunne, in 1966. Didion and Dunne moved from New York to Los Angeles in 1965, intent on making major career changes. According to some accounts, they intended to write for television, but at first they continued writing for magazines. The Saturday Evening Post, a mainstream magazine remembered for its frequent cover paintings by Norman Rockwell, assigned Didion to report and write on cultural and social topics. She wrote a profile of John Wayne (whom she admired) and other pieces of fairly conventional journalism. 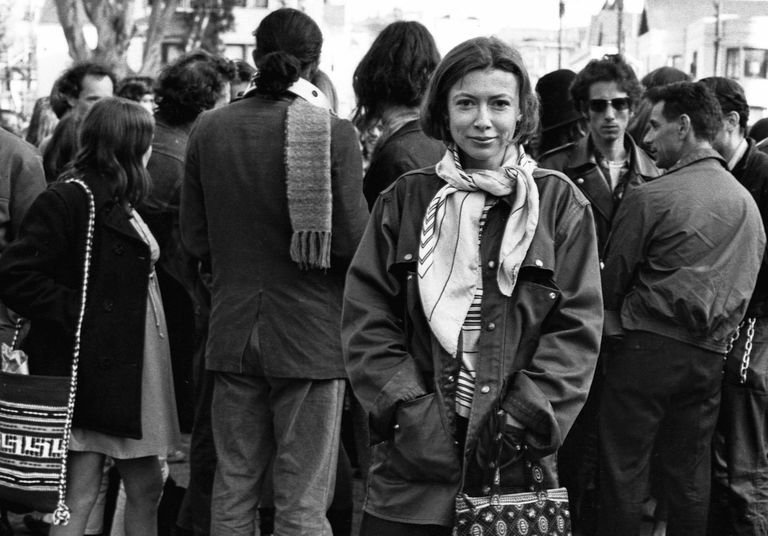 As society seemed to change in startling ways, Didion, the daughter of conservative Republicans and herself a Goldwater voter in 1964, found herself observing the influx of hippies, Black Panthers, and the rise of the counterculture. By early 1967, she later recalled, she was finding it difficult to work. It felt to her like America was somehow coming apart and, as she put it, writing had become an "irrelevant act." The solution, it seemed, was to go to San Francisco and spend time with the young people who were flooding into the city just before what would become legendary as "The Summer of Love." The result of weeks of hanging about in the Haight-Ashbury neighborhood was perhaps her most famous magazine essay, "Slouching Towards Bethlehem." The title was borrowed from "The Second Coming," an ominous poem by the Irish poet William Butler Yeats. The article appears, on the surface, to have little or no structure. It opens with passages in which Didion evokes, with carefully chosen details, how in the "cold late spring of 1967" America was in a time of bleak despair and "adolescents drifted from city to torn city." Didion then described, with novelistic detail, the characters she spent time with, many of whom were taking drugs or seeking to acquire drugs or talking about their recent drug trips. The article departed from standard journalistic practice. At one point she did attempt to interview a policeman who had patrolled the neighborhood of the hippies, but he seemed to panic and stopped talking to her. She was accused of being a "media poisoner" by members of The Diggers, an anarchic group of hippies. So she hung out and listened, not interviewing anyone so much as just observing in the moment. Her observations were presented starkly as what was said and seen in her presence. It was up to the reader to draw deeper meaning. After the article was published in the Saturday Evening Post, Didion said many readers didn't grasp that she was writing about something "more general than a handful of children wearing mandalas on their forehead." In the preface to a 1968 collection of her articles, itself titled Slouching Towards Bethlehem, she said she "had never gotten feedback so universally beside the point." Didion's technique, coupled with her distinct personality and mentions of her own anxiety, had created something of a template for later work. She continued writing journalistic essays for magazines. Over time she would become known for her observations of distinctly American events, ranging from the Manson murders to the increasingly bitter national politics of the late 1980s to the scandals of Bill Clinton. In 1970 Didion published her second novel, Play It As It Lays, which was set in the world of Hollywood in which Didion and her husband had settled. (They collaborated on a screenplay for a 1972 film adaptation of the novel.) Didion continued to alternate writing fiction with her journalism, publishing three other novels: A Book of Common Prayer, Democracy, and The Last Thing He Wanted. Didion and Dunne collaborated on screenplays, including "The Panic In Needle Park" (produced in 1971) and the 1976 production of "A Star Is Born," which starred Barbra Streisand. The work adapting a book about ill-fated anchorwoman Jessica Savitch turned into a Hollywood saga in which they wrote (and got paid for) numerous drafts before the film finally emerged as "Up Close and Personal." John Gregory's Dunne's 1997 book Monster: Living Off the Big Screen detailed the peculiar story of endlessly rewriting the screenplay and dealing with Hollywood producers. Didion and Dunne moved back to New York City in the 1990s. Their daughter Quintana became seriously ill in 2003, and after visiting her at the hospital, the couple returned to their apartment where Dunne suffered a fatal heart attack. Didion wrote a book about dealing with her grief, The Year of Magical Thinking, published in 2005. Tragedy struck again when Quintana, having recovered from a serious illness, fell at Los Angeles airport and suffered a serious brain injury. She seemed to be recovering her health but again became very ill and died in August 2005. 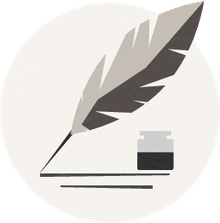 Though her daughter died before the publication of The Year of Magical Thinking, she told The New York Times she hadn't considered changing the manuscript. She later wrote a second book about dealing with grief, Blue Nights, published in 2011. In 2017, Didion published a book of nonfiction, South and West: From a Notebook, an account of travels in the American South constructed from notes she had written decades earlier. Writing in The New York Times, critic Michiko Kakutani said what Didion wrote about travels in Alabama and Mississippi in 1970 was prescient, and seemed to point to much more modern divisions in American society. "Joan Didion." Encyclopedia of World Biography, 2nd ed., vol. 20, Gale, 2004, pp. 113-116. Gale Virtual Reference Library. Doreski, C. K. "Didion, Joan 1934—." American Writers, Supplement 4, edited by A Walton Litz and Molly Weigel, vol. 1, Charles Scribner's Sons, 1996, pp. 195-216. Gale Virtual Reference Library. McKinley, Jesse. "Joan Didion's New Book Faces Tragedy." New York Times, 29 August 2005. Did You Know Gene Wilder Was an Author as Well as a Comedy Legend? What Has George Orwell Written?